Bilingual Baby: When is the Best Time to Start? The benefits of introducing your baby to another language are well documented. In our rapidly globalizing society, knowing a second (or third) language provides an obvious edge over the competition in the job market. But, what about its impact on childhood development? While some would suggest that over-exposure to foreign language may cause delay in speaking, this assumption is both unproven and outweighed by the benefits dual-language babies experience as they grow. The answer is surprising. According to an article by the Intercultural Development Research Association, it may be most beneficial to begin second language exposure before six months of age. In a study by psychologist Janet Werker, infants as young as four months of age successfully discriminated syllables spoken by adults in two different languages. Dr. Werker’s work also determined a possible decline in foreign language acquisition after 10 months of age. To give your child their best start, you must begin early. How is this so? The answer can be found in the complex world of the human brain. Our brains react uniquely to language learning at any age, even growing when stimulated by another language. While mankind can acquire a language at mostly any stage, it is exceptionally difficult to do so outside of childhood. From infancy to age five, the brain is capable of rapid language acquisition. Even so, there are varying degrees of acquisition, even for children. After six months of age, infants begin distinguishing the differing sounds of their native tongue and others. 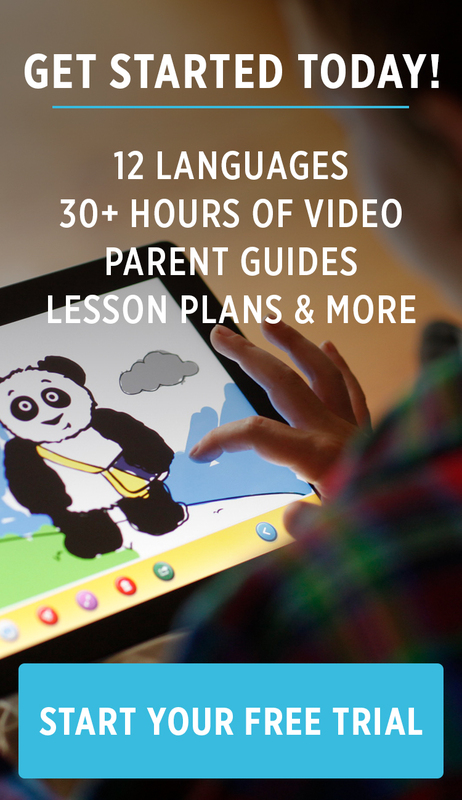 Beyond six months, exposing your little one to a brand new language will pose a challenge. That is not to say that teaching your two year-old French is a bad idea! It is merely to say that the earlier you begin teaching your child, the better. Though most babies wont utter their first words before eleven months of age, they develop complex mental vocabularies through the piecing together of “sound maps.” As they gather from what they are exposed to, an infant who hasn’t been immersed in another language during this delicate stage will not piece together adequate sound maps to differentiate another language. The reason for this is rooted in the brain at birth. Children are born with 100 billion brain cells and the branching dendrites that connect them. The locations that these cells connect are called synapses; critical components in the development of the human brain. These synapses are thought to “fire” information from one cell to another in certain patterns that lead to information becoming “hardwired” in the brain. The synapses transmit information from the external senses to the brain via these patterns, thus causing the brain to interpret them, develop, and learn from them. From birth to age three, these complex synapses cause infants to develop 700 neural connections per second. These synapses are critical in sound mapping, and at the age of six months, the infant brain has already begun to “lock in” these new patterns and has difficulty recognizing brand new ones. This is because although your baby is born with all of the neurons they’ll ever need, that doesn’t mean that they’ll “need” all 100 billion. Infancy to the age of three is filled not only with rapid neural expansion, but also with neural “pruning;” a process in which unnecessary connections are nixed and others are strengthened. Exactly which connections are pruned and which are cultivated is partially influenced by a child’s environment. Synapses are cultivated or pruned in order of importance to ensure the easiest, most successful outcome possible for a functioning human being. If a function is not fostered during this stage, it is likely that the neural connections associated with it will fade. For the brain to see a skill as important, you must make it important. To put it plainly, if you only speak to your child in English, the infant brain sees no reason to retain a neural pathway regarding the little Mandarin it has heard. Babies learn about their environment at every age and are internally motivated from birth to do so. Your baby wants to learn and does so by exploring and mimicking the world around them. They’re entirely capable of building a complex knowledge of Mandarin, Arabic, or Italian. So, why not feed their mind and start now? Experts around the globe agree that language learning begins at a young age. Adults that attempt to learn a new language often struggle, whereas small children have the unique ability to latch on to multiple languages at a time. However, many parents face a dilemma when it comes to the decision of exactly when a child's exposure to another language should begin. It's a topic that poses many valid questions among parents and educators: "When should I begin teaching my child a second (or third) language?" "Should I wait until they can talk?" "Should I wait until they've mastered English?" "Will exposing them to too many languages at once cause communication difficulties later on?" Science has shown us the answer, and it's groundbreaking. Babies can learn multiple languages at a time and have no delay in language development as a result. In fact, beginning multilingual exposure in infancy may give your child an edge over their peers later on. Oral vocabulary is critical for children as they achieve literacy in any language, which doubles when a child is fluent in more than one language. A University of Washington study determined that children exposed to other languages during the first year of life fared better in preschool due in part to the fact that their vocabularies were greatly increased. The bilingual children in the study were shown to understand written language at an earlier age than their peers. Children should be exposed to multilingualism as early as possible. 6-month-old babies can understand spoken language with great clarity. Infants as young as 7 months can understand and keep their languages separate. As children reach a verbal age, they commonly mix languages together, but this is not at all a bad thing. It is a common occurrence in young and old bilinguals alike, called "code switching." Code switching is an almost universal step for children as they learn to verbalize multiple languages correctly. Children that mix their languages do so only temporarily, whereas adults that learn later in life commonly struggle with it. You can teach your child several languages at once without "damaging" them in any way. Considering that over 60% of the world population is multilingual in some way, it's easy to see that human beings are hardwired to know more than one from the start. Learn more about the benefits and how to raise your children to be bilingual at Mom Loves Best. Read the full Mom Loves Best blog post on “How Your Child Can Benefit From Being Bilingual” by Jenny Silverstone for more helpful tips and information. Here at Little Pim, we have many products that encourage language immersion from an early age. Do you have any little polygots running around? If so, let us know in the comments below!